The City of Sunny Isles Beach presents Beethoven on the Beach with Orchestra Miami on Sunday, March 29 and the Florida International University (FIU) Vocal Ensemble with Broadway favorites on Wednesday, April 1. 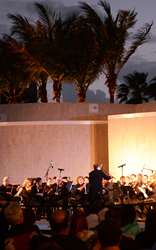 Beethoven on the Beach, performed by Orchestra Miami, will take place at 6:30 pm on Sunday, March 29. Orchestra Miami is led by Founder & Artistic Director, Elaine Rinaldi. This outdoor concert, held at Heritage Park (19200 Collins Avenue), will feature Romanian Folk Dances by Béla Bartók and additional works from Holst, Tchaikovsky, Aaron Copland, and of course, Beethoven! Featured soloist, Soprano Jouvanca Jean-Baptiste, will perform with the orchestra. The concert is complimentary and open to the public. Patrons can park for no charge in the Heritage Park garage or under the William Lehman Causeway. Complimentary Community Shuttle service is also available within the City limits. In the event of inclement weather, this concert will move to Norman S. Edelcup SIB K-8 School at 201 – 182 Drive. On Wednesday, April 1 at 7:00 pm, at the Norman S. Edelcup SIB K-8 School (201 – 182 Drive), the final Four Seasons Cultural Series performance of the school year will feature the FIU Vocal Ensemble. This group is the premier vocal performance ensemble of the Division of Vocal Studies in the School of Music. The group will present well-known tunes from The Sound of Music, Man of La Mancha, Into the Woods and many other Broadway shows as well as opera selections from, The Land of Smiles and Student Prince. Tickets are complimentary for SIB Resident ID Card Holders and $5 without the Resident ID. Tickets may be purchased at Pelican Community Park or the SIB Government Center. Ticket sales at the door are cash only. For questions regarding programs, performances or events please call 305.792.1706.